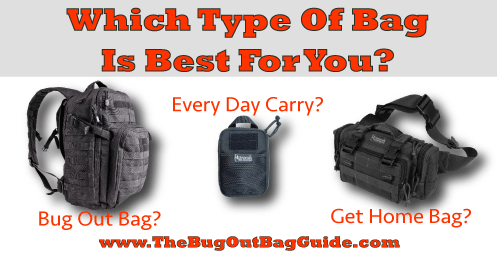 It can be a little intimidating for newbies to know what all these bug out bag acronyms mean, let alone knowing which ones to focus on. Ask 10 people and you get 10 different answers, right? Different people live in different situations and have different needs which is why we need to make it clear what each of them is and to point out the differences so you can make the right choice. Obviously, if you’re looking for information on bug out bags, there is no better resource than the site you’re on right now. Bug-out bags are the first thing newbie preppers take care of when they start. I’m just gonna say it, there’s no such thing as the perfect bug-out bag. Age, location, climate, skill and many other factors come into play when deciding which backpack to get and how to assemble it. I won’t go into details on what it should contain as there are plenty of good resources such as this one and this one but, if you’re completely new to this, let me talk a little bit about the purpose of a BOB. A bug-out bag is simply a backpack filled with emergency essentials that allow you to run from danger, whether it’s natural or man-made. Typically, a BOB contains a lot of tools and items to aid in your survival but it should also contain food and water for up to a week (although opinions differ on this one). Beyond that, you should either be at your bug-out location where more supplies await your or you should pre-pack some tools that will aid you in procuring food and water. Keep in mind that your bug-out bag may also include items for your family members. Another very important set of tools to keep in your BOB are the ones that help you survive in the wilderness. You just never know if you’re going to make it to your destination so having a tent or a tarp, several ways to start fire, a couple of light sources and so on… these are all important. Out of all the survival bags in this article, this is the only one I don’t recommend. The 72 hour pack is nothing more than a simplified version of the BOB that has a catchy name, reason for which survival companies use it to sell you this pre-packed bag. In reality, you’re much better off doing it yourself as you’ll save cash and make it such that it can help you survive for much longer than 3 days. It’s obviously better than nothing so if you really want one, that’s up to you, but this article plus the well-researched articles on this site make this type of bag a poor choice for newbie and advanced preppers alike. A 72-hour pack can serve as a lightweight option for day hikers to prepare for the unexpected. The second favorite bag for preppers is the get home bag and it is built with one purpose in mind: to help you get from when you are when disaster strikes either home or even to your bug-out location (BOL) if it is feasible. There’s an excellent chance that you won’t be at home when disaster strikes and that you’ll have to get there in record time and, possibly, even have to face certain obstacles. A GHB is also useful when you’re forced to leave your car. The main difference between a GHB and a BOB is that a GHB is made for short distance emergency traveling (typically less than 100 miles), it has a lot less items in it and it’s also lighter. Forced to leave your car behind, you’ll be glad to have your get-home bag well-equipped to commute on foot. The thing is, most of the items you have in your get home bag are already in your bug-out bag but the entire reason you need this second one is because you know you’ll be away from your main BOB when it happens. When the line between get home bags and bug-out bags is really blurry is when we’re talking about cars. It’s good practice to have supplies in your car because it’s going to act as your bug-out vehicle so, when you think about it, the emergency survival bag you have in your trunk can act as a get-home bag just as well as it can be a BOB. Whether it’s one or the other, it all depends on how much you pack. At the end of the day, the more you have the better but keep in mind that a heavy pack will make it harder for you to move. Backpack $$$$ Extremely high quality construction and well thought out pocket design make this a flexible and practical bag for real-world use. Molle integration along with hydration bladder compatibility mean easy customization to suit your exact needs. Maxpedition Falcon II Backpack $$$ Tough ballistic nylon construction protects gear and stands up to any conditions. Compact size keeps shape even when full making it easy to stash at work. Removable waist and chest straps distribute weight evenly. Backpack $ Sturdy option at an economical price. Plenty of MOLLE attachment points and straps to carry extra gear. Multiple compartments ideal for easily accessing Level 1 items. Padded straps provide comfort for prolonged wear. ALPS OutdoorZ Little Bear Hunting Lumbar Pack Lumbar Pack $ Compact with mulitple compartments. Removable straps offer improved weight distribution. Mountainsmith Lumbar Backpack Lumbar Pack $$ Reinforced with high tenacity nylon wide. 14L capacity and extra mesh pockets on the waistband provide sufficient storage space for its compact profile. Shoulder strap pad for messenger carry or separately purchase Mountainsmith Strapettes for additional carrying options. High Sierra Diplomat Lumbar Pack Lumbar Pack $ HEX_VENT mesh padded back panel wicks moisture. Multiple compartments and 2 external water bottle holders (BPA-free bottles included). Webbing and tuck-away mesh pouch for loading additional gear. Rapid Dominance Classic Military Messenger Bag Messenger Bag $ Cotton canvas with polyester lining. Large 16L capacity and 2 inch wide comfort strap to handle larger loads. Subtle appearance conceals its purpose. UTG Urban Messenger Bag Messenger Bag $ No top flap enables all compartments to be readily accessible while on the move. Specialized slots for holding tools. Detachable pistol holster with belt loop. Discreet for daily carry. Maxpedition Last Resort Tactical Attache Messenger Bag $$$ Heavy duty water resistant nylon exterior. Removable divider lends to customizing main compartment. Multiple hook and loop pockets for smaller gear. Camelbak HAWG 100 oz Hydration Pack Hydration Pack $$$ Sufficient gear storage capacity plus 3L hydration bladder. High density nylon harness with EVA foam shoulder padding. MOLLE attachments on front panel for additional gear. CamelBak M.U.L.E. 100 oz Hydration Pack Hydration Pack $$$ Separated compartments for Level organization. Compact size easy to manuever thrrough crowds. Multiple hydration tubing exit points. fleece-lined pouch ideal for safely storing eyewear. Osprey Men's Manta 36 Hydration Pack Hydration Pack $$$ Weather protected with integrated raincover. Over 30L capacity rivals a backpack and hipbelt provides support for heavier loads. Airspeed suspension and BioStretch harness team up for a comfortable and ventilated fit. People who prefer INCH bags are planning to survive harsher conditions and longer periods of time without a permanent shelter. A bug out bag can take you to your bug out location but if you’re not able to get there within a few days, maybe a week, surviving is going to be very tough for you. An INCH bag assumes your home and your bug-out location are compromised. Your INCH bag should include gear for making fire, as well as means of obtaining and preparing food. The contents of an INCH bag is very similar to that of the BOB although more items will be required. This doesn’t necessarily mean you need to get more food but more ways to procure that food. Keep in mind you might be forced to live in the wilderness for months on end and even have to make a permanent shelter with your bare hands. Designed to help you survive for: up to a few hours. The everyday carry kit is the smallest “bag” you can have. I wrote bag inside quotation marks because you don’t really need one. Your EDC is all about the items you carry with you on a daily basis when to help you get away from danger and to one of your other survival bags. Items that could be a part of your EDC: your phone, wallet, a small flashlight, a button compass, paper clips, a Paracord bracelet, a Bic lighter, a bandanna and so on. They are only limited by the number of pockets you have and by how much you’re willing to carry with you every single day. The funny thing is that even with EDCs, you may not have all the items with you at all times. Your phone is within a couple of feet from you most of the time but sometimes you forget (or just leave it) when you go about your day. Your flashlight or multitool may be uncomfortable to keep in your pocket. That is where having a designated EDC bag can come in handy. Your EDC kit may fit easily in a small pouch or you may prefer a messenger bag or backpack that can fit your laptop and other larger items. For help choosing an EDC bag, CLICK HERE. Can One Survival Bag Double As The Other? Definitely! Your EDC can also be your GHB or your GHB can act as your BOB. It depends on a lot of things but I think the factor that matters the most is your lifestyle. For example, if you’re travelling a lot by car then it makes sense that your get-home bag and your bug-out bag are one and the same and safely secured in your trunk. Spending so much time around the car, it may not make much sense to have both (unless you’re more advanced and you don’t mind the extra investment). Whichever bag you choose, the most important thing is that it equips you for YOUR survival situation. Another example is when you’re taking your laptop to work each day and you have one of those backpacks that can fit any portable computer nicely. That backpack plus whatever you have in your pockets can make a nice EDC-GHB combination for urban environments starting from the premise that you’ll have that bag near you at all times. The issue with these acronyms is not that they exist. The real problem is that people think in terms of “Hey, I gotta have this or that type of bag” instead of thinking about all the various scenarios that may occur and then making their choice. So, what you should be asking yourself are things like “Well, if I’m stuck in the city and all the means of transportation suddenly stop working, how do I get home?” Questions like these help you narrow down the events with the highest likelihood of occurring so you can figure out which items you need so you can FINALLY figure out which survival bag to get. I hope that makes sense and that you assemble the right bag(s) for you and feel confident you’ve made the right choice. Have you started building a BOB, GHB, INCH, or EDC kit? Do you agree that a 72-hour pack is a weaker option for most preppers? How do you handle overlap in the purpose of each bag? Share your thoughts in the Comments section below, thanks!